Martin has unveiled a new Eric Clapton signature acoustic, the 000-28EC Crossroads Madagascar. Limited to 150 instruments and five left-hand models, the Martin Custom Shop-built guitars feature the sort of specs we've come to expect from a Clapton signature, including tone woods such as Madagascar Rosewood sourced from Martin's special reserve, a 'Crossroads' pearl headstock inlay and 14 fret neck, 000 body size and 24" scale. "It's been my experience that the proper guitars, like those in this Collection, are just made for playing - the motive behind the making of the guitar is 100% right," says Clapton. "They are beautiful guitars; from the inlays to the rosewood they are unique from one another. One would be inclined to take care of and be in awe of them." The 000-28EC Crossroads Madagascar is scheduled for delivery in the UK this summer and can be pre-ordered through Martin Heritage Centres (find your nearest centre here). 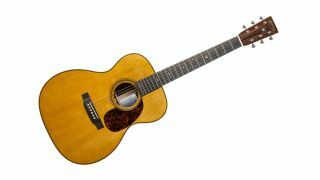 The guitar ships with a signature case, leather strap and signed certificate of authenticity, as well as a hefty price tag - the 000-28EC has a UK SRP of £5299. However, a large chunk of that money will be donated to Clapton's Crossroads centre, which takes the sting off it a bit. For more information, visit the official Martin website.